Featuring a woven stripe design, this collection is simple but sophisticated, and will look beautiful. 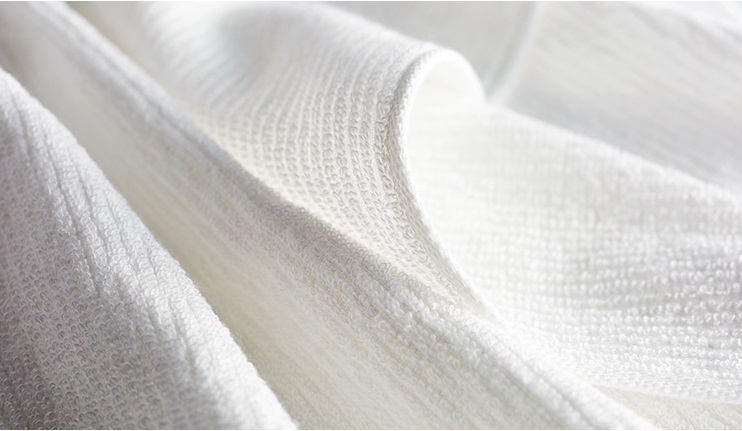 Produced in the famous towel-making region of Imabari, Japan, this towel is known for their superior absorbency, lightweight texture, and natural softness. Its environmentally friendly manufacturing process gives it a signature softness. 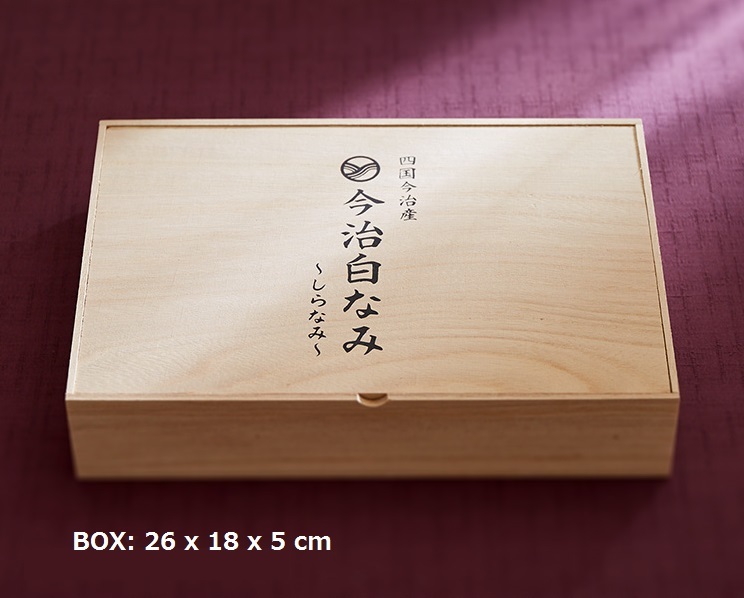 Packed in the prestigious wooden box for the best enjoyment no matter as a gift or personal use. 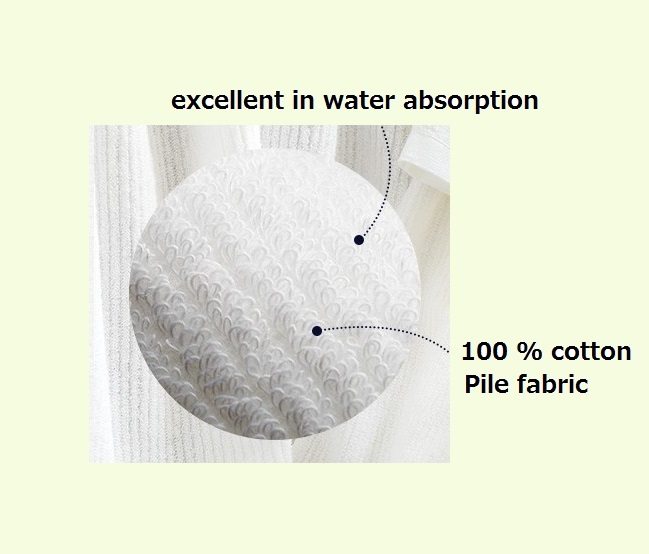 100% cotton, excellent in water absorption, it is also good for sensitive and soft skin type. Diese Kollektion mit gewebtem Streifenmuster ist simple, aber raffiniert und sieht wunderschön aus. Hergestellt in der berühmten Tuchmacherregion von Imabari in Japan. Imabari-Towel ist für seine hervorragende Saugfähigkeit, leichte Textur und natürliche Weichheit bekannt. Sein umweltfreundlicher Herstellungsprozess verleiht ihm eine einzigartige Weichheit. Verpackt in der prestigevollen Holzkiste für den besten Genuss, egal ob als Geschenk oder persönlicher Gebrauch. 100% Baumwolle, ausgezeichnete Wasseraufnahme, auch für empfindliche und weiche Haut geeignet. 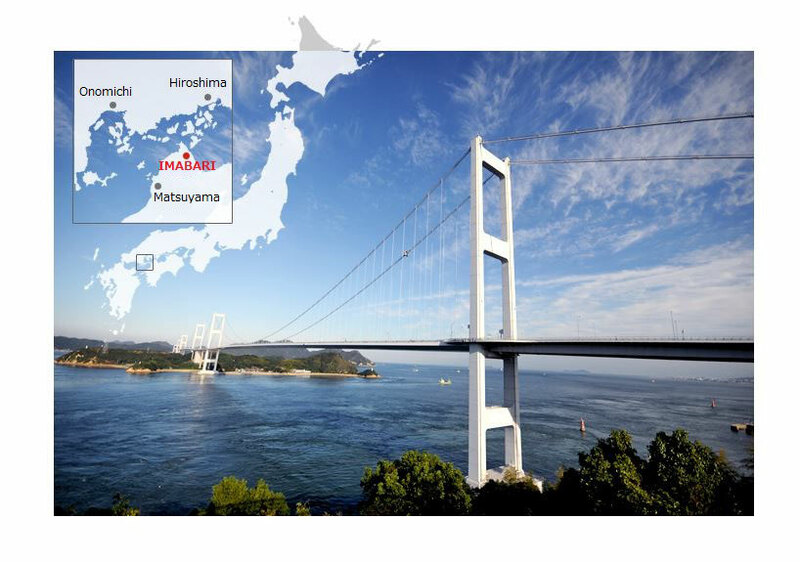 In Imabari City is located in the northeastern part of Ehime Prefecture, more than 100 firms are engaged in towel production and related industries such as dyeing, printing and industrial sewing. Encouraged in production by the lord of the castle, Imabari has been in the cotton industry since the Edo era. The region where imabari towels are produced is blessed with soft water with very little content of heavy metals, such as the subsoil water of Soja River that runs from the Takanawa Mountain Range and underground water coming from the sacred Mt. Ishizuchi. Through bleaching using water of such fine quality, it is possible to produce fabrics that are delicate and soft to the touch and showing vibrant colors. 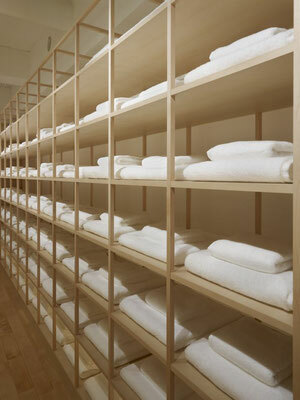 The imabari towel has been produced since 1894 when the cotton flannel machine was converted for manufacturing towels. In order to make towels that, while being great for various purposes and usage, are also easy and gentle to use, master craftsmanship of various crafts work together from material selection, weaving, and dyeing all the way to post-processing. At the present day, about 4,000 looms and 3,000 employees in Imabari produce an annual shipment value of 50 billion yen, which forms more than 60% of the entire towel production in Japan. 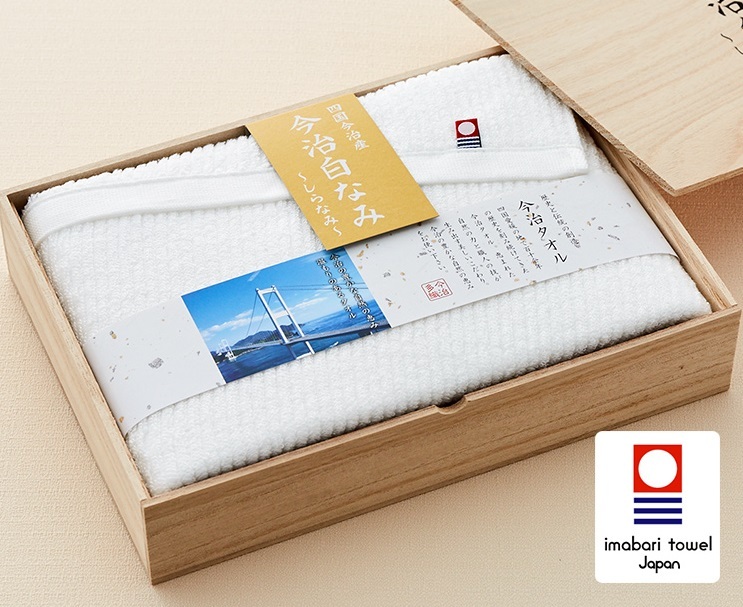 Today, the Imabari towel is known worldwide as a brand that respects the tradition of the craftsmanship. 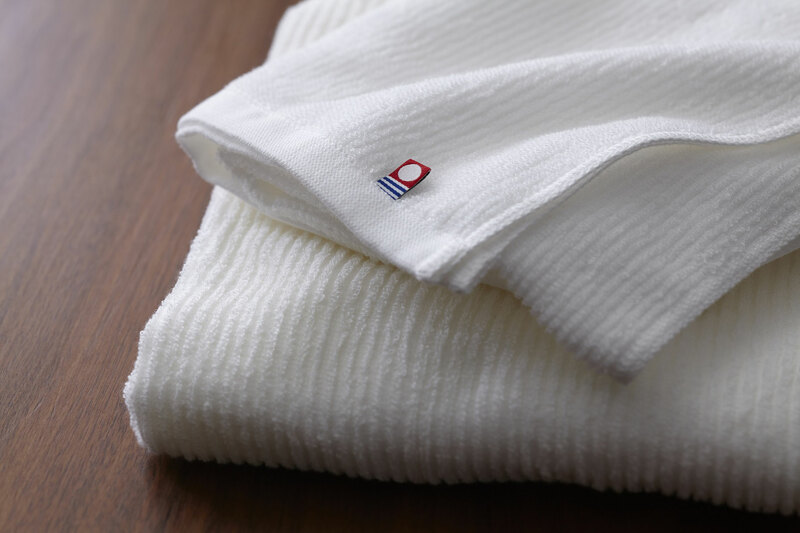 The brand's logo symbolizes imabari towel's high quality based on its history and tradition. It was developed as a “symbol” which presents to the world various information about the towels. The each color of red, blue and white indicate a positive image of assured; - energy, passion and progressiveness in red - quality, trust, history, tradition, and calmness in blue - innocence, cleanliness, healing and gentle in white. Only towels that meet the highest standard in the production process and make it through quality control can be considered "authorized Imabari towels”. The rigorous inspection process guarantees safety and quality.